The Suit of Swords represents the amazing and complex realm of the mind. The gift of a fully integrated mind is the ability to tap into vast realms of imagination, inspiration and enlightenment. To pursue original thinking, construct reality and perceive truths. The Ace of Swords begins this suite with the first clear impulse towards this level of mind. 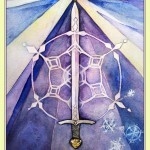 The central motif of this card is a sword piercing through a delicate snowflake. A snowflake is an water crystal, representing frozen crystallized emotion. This deck is centered on the water element because biologically and psychologically we belong to the water element. Our bodies are predominantly water which is the symbol of the emotional realm. This ties into the fact that we are also highly emotional beings. The rational part of our brain is the most recent part of the brain to form and also the one that takes the most effort to develop. We are naturally emotional, but the intellectual faculty must be cultivated. We experience the world immediately through emotion and then the mind responds as a buffer deciding what it can safely process and what is just too much. When an emotional experience is too overwhelming, too traumatic or too big for a person to fully accept and incorporate, it then becomes stored within the person. The person starts freezing the emotion into intricate concepts, thought patterns and ideas in order to lessen its raw impact. We freeze the watery nature of the emotional experience into intricate angular constructs or frozen patterns that we can then handle, analyze and control. This is how fluid water transforms into snowflakes; how emotions become intellectual. These crystal formations function just below the surface of our awareness. They form our boundaries such as what we accept and reject and our likes and dislikes. These crystallized mental patterns spin in our minds and become the basis of our habits, addictions, worries, and fears. These patterns form the clutter of our lower mind and make it difficult to think and perceive reality clearly. They form a filter through which we perceive our world. When the mind is able to pierce through this lower layer of patterns and loosen the comfortable grip of habit, there opens up a pathway, like a beam of light into the higher mind where a unified level of clarity, focus and insight exists. At this level, real thinking and true reasoning can take place. The mind is not slowed down and influenced by the heaviness of the habitual and reactive mind which is under the power of its frozen emotional patterns. The energies of the Ace of Swords expresses the first impulses for such an opening. 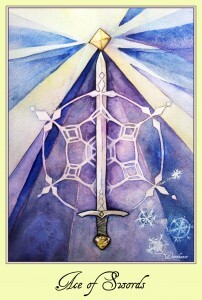 In this card we see an upward pointing sword symbolizing the active and sharp intellect piercing through a water crystal and reaching the higher mind. It releases enormous insight, inspiration and illumination. The sword touches a golden quartz crystal which is the sacred storehouse of our collected wisdom. When we look at a frozen crystal formation and we dare to dive into its construct, to reflect on it, analyze it, question it and test its validity, we start the process of unraveling it and of melting it back down into its original state. We move into its origin and revisit the raw place from which it came from but with a present level of understanding. We pierce through the snow crystal and experience the truth of it. The insight that is gained opens up the wisdom level of our higher mind. Our insights accumulate here in this higher mind, and contributes to our own Personal Library of Wisdom. Tapping into this level is a blessing because if gives you access to your Library of Wisdom. It brightens your mind and your intellect. When you get this card, feel the brightness in your mind. Feel the enlightening impulses of insight and revelation taking place. You are working through an emotional pattern that has been stuck and frozen and is now loosening up. In this loosening up there is release in the form of insight. and new clarity. Pay attention to your insights, reflect on the ‘Why’. Let your insights bring light into your mind and vision. Take in this moment of inspiration and see how it can fit into your world. This card can indicate a brilliant new idea, insight into a problem, a spark of genius, opening to a bigger paradigm, clear thinking, letting go of doubts and connecting to your inner wisdom. This entry was posted in Swords, Tarot on January 26, 2014 by darshanie.